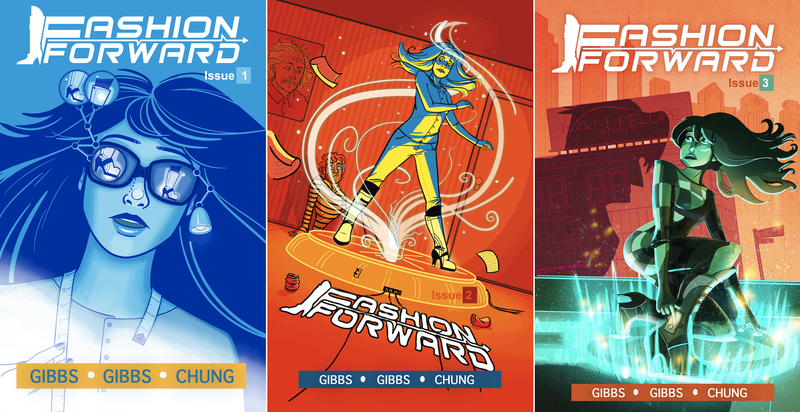 Fashion Forward is a sci-fi comic book series created and written by Shawnee´and Shawnelle Gibbs with art by Linda Chung and JM Tolman. Samantha Tate gave up a promising design engineering career for a chance to pursue her first love: fashion design. But her more geek than chic personality is a liability in the larger than life world of haute couture, where the weak are ripped to shreds like cheap charmeuse. With the help of a physicist friend, she creates the answer to her dilemma: a funky, time traveling device that allows her to venture seasons ahead in time, a place any designer would sacrifice generations of unborn collections to see. Sam finds herself further ahead than she ever imagined on a reckless adventure that may jeopardize New York’s most elite and change the future of fashion forever. The Gibbs Sisters (Shawnee´ & Shawnelle Gibbs) are an award-winning writing team from the San Francisco Bay Area with a background in comics, television, and animation. They are the creators of the YA comic, "Fashion Forward," which was syndicated by the Daily Dot in 2014. The pair are at work on the upcoming African-American steampunk adventure, "The Invention of E.J. Whitaker" and will be featured in Graham Cracker Comic's "Ladies Anthology Volume 3: How To Magic (A Complete Guide)." The Gibbs Sisters are members of the Writers Guild of America West and alumni of the renowned USC Guy Hanks & Marvin Miller Writers Fellowship. Their most recent work includes publication in Graham Cracker Comic's "Death & Prom Anthology." Adam Fay is the cover artist for Book 3. (Comic Book Resources) - Comic Book Resources calls Fashion Forward, "one charming comic book adventure" in this feature for Comics Should Be Good's spotlight on African American creators. (The Daily Dot) - Shawnee´& Shawnelle are interviewed on the topic of breaking into web comics. Blood, Sweat and Ink: Breaking into Webcomics in 2014. (xoJane) The Gibbs Sisters featured as 10 Female Filmmakers Ruling Indie Cinema. Shawnee and Shawnelle declared "...original and hilarious." (Sugar and Snark) Fashion Forward, Vol. 1 gets a 4 out of 5 book review from Sugar and Snark. (Girls Read Comics) Fashion Forward hailed as 'witty, fun and upbeat!" by Girls Read Comics. Article by Senior Contributor, Chantaal. Fashion Forward The Comic Book Series on Comixology!